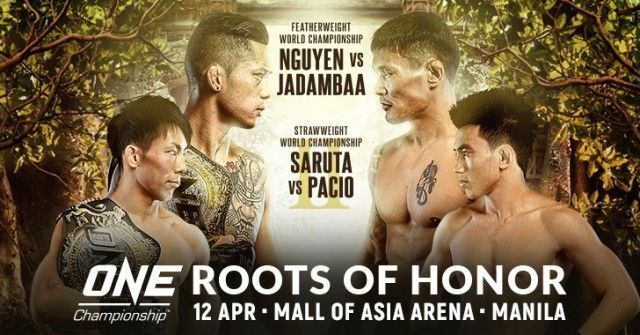 Hot on the heels of ONE Championship’s star-studded evening in Tokyo’s Ryogoku Kokugikan two weeks’ ago, the South East Asian promotion returned to more familiar ground at Manila’s Mall of Asia Arena last night. 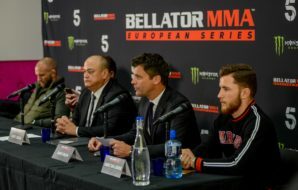 Whereas ONE Championship’s ‘A New Era’ event in Tokyo was billed as taking the promotion to a new level, both in terms of being their first event in Japan and the first outing of their new former UFC signings Demetrious Johnson and Eddie Alverez, the return to Manila is more of a homecoming. Manila can be considered the spiritual home of ONE Championship with the Philippines providing some of their top athletes and Filipino fans being the most numerous as well as some of the most vocal and passionate. Although not quite as spectacular a card, ONE Championship Roots of Honor was a great evening with knockouts galore. 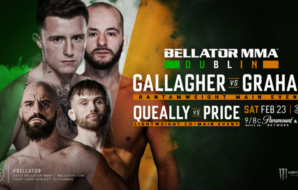 Former two division champion Nguyen has returned to his natural Featherweight division after losing his lightweight title to Filipino Kevin Belingon in July last year. Nguyen changed gyms for this fight with a training camp at Hard Knocks MMA in Florida. The results speak for themselves with a hungry Nguyen fighting hard against the 43-year-old Mongolian. Round 1 saw both men trading jabs and kicks with Nguyen landing some impressive high kicks to the veteran. In round 2, Nguyen’s leg kicks caused Jadambaa to move back allowing Nguyen to launch a flying knee to knock out the Mongolian defending his title in style. 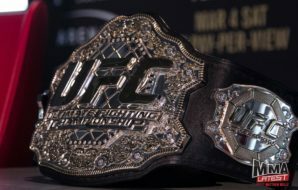 The strawweight title fight saw a rematch between the 23-year-old home favourite Joshua Pacio and defending champion Yosuke Saruta. The last time these two met, Saruta beat Team Lakay’s Pacio to take his belt in a controversial split decision. 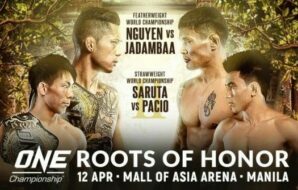 ONE championship CEO Chatri Sityodtong believed the fight should have gone Pacio’s way and immediately called for a rematch. Saruta ‘The Ninja’ came out in full Ninja garb, however, Pacio was the superior fighter on the night. 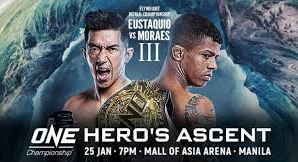 Pacio landed several signature wushu spinning back kicks, but it was in the 4th round that the Filipino landed a flying knee to the head of his opponent finishing the fight with a dramatic KO. 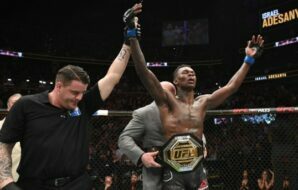 This fight was for the remaining spot in the Flyweight grand prix with the winner to face Demetrious Johnson. At 4 ft 11, the diminutive Cuban fighter Balart was all power, aggressively moving forward throughout the fight and causing problems for Wada. 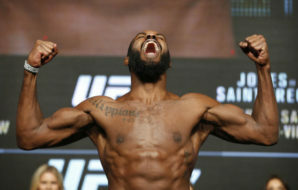 Standing at 5 ft 7, Wada clearly struggled with the height differential in round 1 but found more opportunities to land strikes in subsequent rounds claiming the victory by unanimous decision to move forward to face Mighty Mouse Demetrious Johnson next. Long-time Evolve MMA BJJ coach Leandro Issa showed off his grappling prowess in his fight against Chinese boxer Fu Chang Xin. Issa came out seeking a takedown and quickly succeeded, swiftly moving on to side control and mount. Xin fiercely defended a tight armbar from Issa, but straight away lost his position and ended up in a tight triangle. 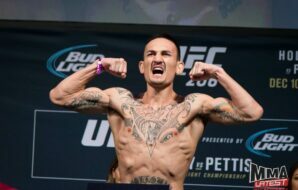 Issa once again attacked the arm resulting in a well-deserved first round submission. Romanian Stoica looked the better fighter throughout this bout. 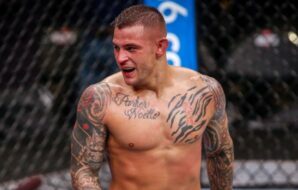 A cautious approach from both men saw the referee repeatedly calling for action with the final result a unanimous decision for Stoica. The undefeated American wrestling champion Nakashima (10-0) went up against the massively experienced Brazilian Santos (65-11). 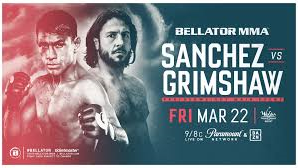 After searching hard for the takedown in round 1, Nakashima got the job done in round 2 but what looked like a knee injury forced Santos to retire. South Korean grappler Sung Jong Lee fought against the hometown hero Edward Kelly from Team Lakay. 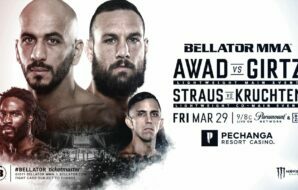 Kelly, wearing the lucky team Lakay red pants and managed to evade Lee’s 10th planet heel hook attempts to ground and pound the Korean into a round 2 knock stoppage. A heavyweight bout under kickboxing ruleset showcased the power of these two heavy hitters ending almost inevitably in a knockout. A heavy round 1 right-hand clip from Silva put Meunier on the canvas leading to a quick KO win for the Brazilian.